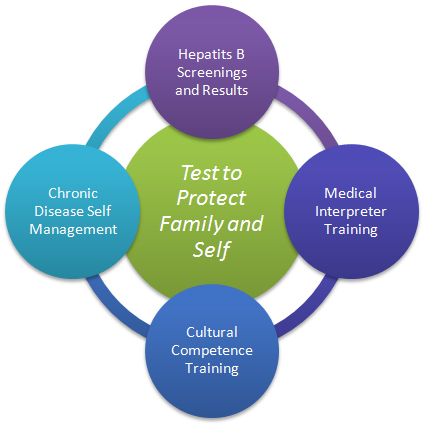 Test to Protect Family and Self is a Hepatitis B Initiative in the Vietnamese-American Communities of Harrison, Hancock, and Jackson Counties. Hepatitis B is a virus that can cause liver disease and lead to liver failure or liver cancer. Some cases of Hepatitis B can cause chronic, lifelong illness. Hepatitis B is common among Asian-Americans and Pacific Islanders (AAPI). It is estimated that 1 in 12 AAPIs is living with undiagnosed Hepatitis B, accounting for over half of the 1.2 million Americans living with the disease. An estimated 8,500 Vietnamese-Americans live on the Mississippi Gulf Coast. The MSDH Health Equity team has partnered with Boat People SOS and Mercy Housing and Human Development to provide culturally appropriate Hepatitis B education, screening, and treatment referral. The goal of Test to Protect Family and Self is to increase awareness, improve surveillance and clinical outcomes, and lower the Hepatitis B burden in the Vietnamese-American community on the Mississippi Gulf Coast. Hepatitis B screenings are held for the Vietnamese-American community of the Gulf Coast. For dates and locations, contact the MSDH Health Equity team. MSDH is a licensed provider of the Cross-Cultural Communications training for to medical, educational, and social services interpreters. Community interpreter trainings are offered in Mississippi to increase the number of qualified interpreters. For upcoming trainings and to learn more about training requirements, contact the MSDH Health Equity team. Cultural competence training will be offered to increase healthcare system's capacity to serve diverse patient populations and improve quality of care at an organizational level. The MSDH Health Equity team will be offering a leader training for Stanford's Chronic Disease Self-Management Program. Trained leaders will be able to successfully host a six-week, two-and-half-hour training on managing chronic illnesses. Recommended materials for providers and health educators. Hep B United is a national coalition to address and eliminate hepatitis B. Read CDC information on Hepatitis B. Boat People SOS provides services to Vietnamese Americans in Vietnam, America, or on the high seas. At Mercy Housing and Human Development, our main goal is to provide home-ownership opportunities to families whose income is between 30 percent and 80 percent of local HUD median income.